Why is “connect” still gray? After I dutifully typed the (fairly straightforward) password into the form field, the “connect” button remained grayed out. I clicked it a couple of times before my eyes moved back up and to the left and saw the terms of service checkbox, with pretty much unreadable text. 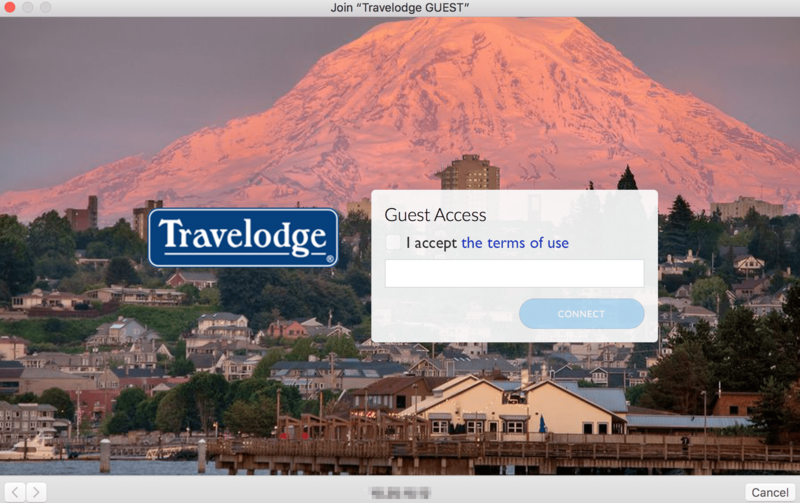 This login form breaks at least two design best practices. First, when the functional area is a box floating on top of a photo like this one, everything required for connection should be inside the box. Our eyes will not attend to anything outside of the box, because the box frames the task. Second, be certain that any text has sufficient contrast and size to be legible. The redesign is quick and straightforward. We need to move the “accept terms” condition into the floating box (logical sequencing), and we need to think about both type size and contrast (legibility). Also, if there is no obvious reason to change link colors, make an unvisited link a readable shade of blue. The connect button should still require that both check box and password field be completed before it lights up. But with this visual sequence, the user should not type a password and then wonder why she still cannot connect. The post Make your password form fields logical to use appeared first on WiredPen. Since the 2016 president election, we have been actively reliving the mid-1800s run-up to the Civil War. White House historical parallels center on Nixon and Watergate. But the big social issues – especially gun use – center on slave state beliefs. As protests around the nation – in all 50 states as well as around the world illustrated on March 14 and 24 (and will again on April 20), the majority demands that the right to enjoy peace must have a renaissance. Dear journalists: You can say millions march across the country. Millions. Not "thousands" or "crowds." "Millions" is correct. Even if it makes some of your readers mad. Memo to elected officials: millennials will out-number boomers by 2019, and they appear to be as politically engaged as said boomers were in the 1960s and early 1970s. The nation’s first “high profile” classroom shooting illustrates perfectly how the NRA “vision” for the 2nd Amendment is grounded in southern slave state culture. Legal critics of the trial argued that Kentucky law had veered too far from mainstream American constitutional thought, which had always balanced the right of self-defense against other rights, such as the right to enjoy peace. According to this way of thinking, Ward’s actions were not a vindication of American ideas of liberty, but a distortion of them, encouraging anarchy rather than true liberty. Will the 2018 protests be ineffectual? I hope not. I think not. In the intervening 165 years, the divide between states that honor “mainstream American constitutional thought” which balance the right of self-defense with the right to enjoy peace and the states that elevate gun rights over all others has become a rift that is beyond comprehension. It is also a rift that politicians on the right since Nixon have used to foment fear and horde power. Although the Parkland rampage has been the trigger for current attention to America’s gun problem, it’s important to remember that mass shootings are not an exclusive to our schools. You don’t need an AR-15 to protect your home or take down a deer. This weapon only has one purpose, killing. Data (2010) from 23 high income countries reveals that the US gun homicide rate is 25.2 times higher than in other high-income countries. For 15- to 24-year-olds, the US gun homicide rate is 49.0 times higher. Homicides, not suicides. Most gun deaths in the US are suicides; chew on that for a moment. LIVED IN THE UNITED STATES. Less than half the population, but 82% of all firearm homicides. The United States has an enormous firearm problem compared with other high-income countries. Americans are 10 times more likely to die as a result of a firearm compared with residents of these other high-income countries. Australia, Austria, Belgium, Canada, Czech Republic, Denmark, Finland, France, Germany, Hungary, Ireland, Italy, Japan, Korea, Netherlands, New Zealand, Norway, Portugal, Slovak Republic, Spain, Sweden, United Kingdom (England and Wales, Northern Ireland, Scotland) and the United States. If any other “consumer product” yielded this kind of risk factor, we would act. You’ve far less likely to drown than be killed by a firearm, yet we have laws that require homeowners to fence backyard pools (attractive nuisance). You’ve far less likely to die in a fire, explicitly because we have fire codes. You’ve even less likely to die in an earthquake, again, the province of public safety building codes. Firearm violence and death is a public safety issue. It’s past time to treat it like one. * In this instance, Florida law shows that the state is related to the Confederacy although culturally Florida is not like the rest of the deep south. The post Historical context surrounding March for Our Lives movement appeared first on WiredPen. Do you know the extent of the Trump White House turnover? As of this writing, 35 senior level staff have resigned or been fired. One has pled guilty in the Mueller investigation. Although President Trump claims that the White House is not in chaos, there has been an unprecedented level of turnover for an Administration that is barely into its second year. Two Cabinet officials are out (Tom Price, Rex Tillerson), and we’re on our third national security adviser (with the first one, Michael Flynn, pleading guilty in Mueller’s investigation). Bookmark this page to keep track of who’s out of the game (so to speak). I’m also tracking changes to Trump’s legal team. Shoot me a note if I’m missing someone. The post Tracking White House resignations and firings appeared first on WiredPen. The activism since the mass shooting in Parkland, Florida, on Valentine’s day, particularly the response to the “thoughts and prayers“, is beyond anything I can recall. Perhaps the most prominent event is March For Our Lives on March 24, organized by survivors of the Marjory Stoneman Douglas High School shooting. There’s a national walkout (student-organized) on April 20, the anniversary of Columbine as well as a national walkout (Women’s March organized) on March 17. Nevertheless, the words are typed out, again and again. My thoughts and prayers are with the victims, their families and everyone in Oak Creek who has been impacted by this tragic act of violence. 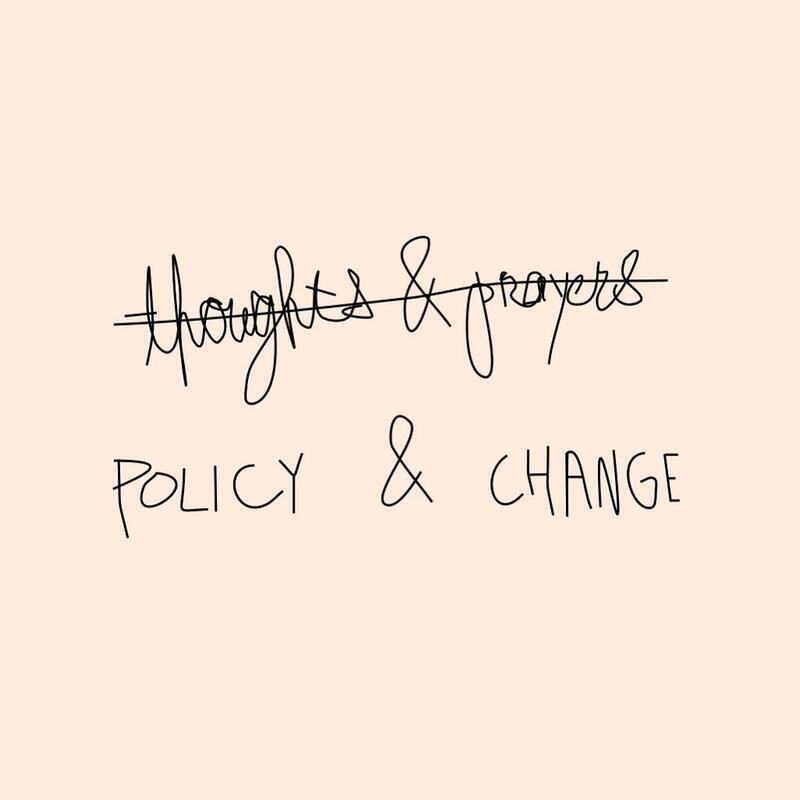 Critics decry the fact #ThoughtsAndPrayers are the extent of GOP involvement: no acknowledgement of a problem means no further action. But this shooting has motivated critics beyond the response to the horror that was Las Vegas. And the satire continues, almost two weeks after the shooting. #neverForget, indeed. Sailor J is a popular YouTube make up artist. Her satirical look at a “thoughts and prayers” line of makeup includes a link to a GoFundMe for Parkland. She deserves your attention and up-vote. Instagram is the home of the visual meme, and my colleague Leslie-Jean Thornton at ASU routinely archives them. Unlike prior mass shootings, this one has legs (life beyond 48 hours). Twitter, in general, attracts an older demographic and one that is more text-focused than visual. But #thoughtsAndPrayers is a popular hashtag there, too. 3) Send my thoughts & prayers to those grieving the loss of their AR-15s. * And toss in a lot of thoughts and prayers. In advocacy not unlike the movement that led advertisers to abandon Rush Limbbaugh, NRA critics began calling for companies affiliated with the National Rifle Association to drop their partnerships. The first to bail was the private credit card company First National of Omaha. The post Thoughts and prayers, a “solution” to mass shootings, is widely ridiculed appeared first on WiredPen. On 19 February 1942, President Franklin D. Roosevelt signed Executive Order 9066 which led the Pentagon to “[define] the entire West Coast … as a military area.” The result: internment of more than 120,000 Japanese Americans; two-thirds were citizens. In one of our most shameful acts as a country, we forced Japanese Americans to abandon their homes and businesses. We shipped them off to military internment camps scattered around the country. In 1983, a pro bono legal team with new evidence re-opened the 40-year-old case in a federal district court on the basis of government misconduct. They showed that the government’s legal team had intentionally suppressed or destroyed evidence from government intelligence agencies reporting that Japanese Americans posed no military threat to the U.S. The official reports, including those from the FBI under J. Edgar Hoover, were not presented in court. On November 10, 1983, a federal judge overturned Korematsu’s conviction in the same San Francisco courthouse where he had been convicted as a young man (emphasis added). The 1944 Supreme Court decision still stands. But here’s the rub: the 1942 action did not come out of the blue. In the 1920s, white residents in Hollywood were agitating against Japanese American ownership of land. One Flickr share credits an Ellis Island exhibit but provides no other context (such as location or date). Another credits the Minidoka Internment National Monument display inside the Hagerman Fossil Beds National Monument visitors center (also no additional context). Here’s one from Manzanar prison camp, which helps explain why some think the photo is from the 1940s. A fourth implies that the photographer might be Rebecca Dramen (but no Google search validated that idea). A Smithsonian reference dates a cropped version of the photo to 1920 (it is from 1923) and credits the National Japanese American Historical Society. This link is in a StackExchange post. The Smithsonian has a very large collection of photos related to Japanese Americans and the Constitution which is accessible by search. The photo collection is part of what appears to be an older online exhibit which is Flash-based; that helps explain why it doesn’t show up well in a Google search. The lady in that picture was my grandmother Mimi – my grandfather was very racist – she wasn’t. She was a descendant of the Spanish Land Grant families. The house on Tamarind Ave. is no longer in the family – it was very embarrassing to the family when that picture was published in the April ’86 issue of National Geographic, maybe to make up for bad karma my daughter and a cousin love Japanese culture. If you, like me, have not heard of this group, perhaps it is because we aren’t from the LA area. Or are white. Or haven’t taken it upon ourselves to learn about the bigotry that peppers our history. And lo and behold, there is my photo: immortalized in a dissertation from 1927. The photo ran in the Los Angeles Examiner on 18 May 1923. The “Hollywood Protective Association” photo was published in the Los Angeles Examiner on 18 May 1923. Finally, an ongoing plea to credit the source of any photo your share online, including those that you have taken yourself. This is also a plea to honor copyright (search Creative Commons licensed photos first), but at a minimum link back to the source. If that source has no information on provenance, either do the work (and yes, it’s work) or DON’T LINK TO THAT IMAGE. The post Today in history: FDR orders Japanese-American internment appeared first on WiredPen. Check library books availability while browsing! If one of your new year’s resolutions was to read more (or borrow more library books than you buy at Amazon), have I got the tool for you! The Library Extension for Chrome (Firefox is in development) lets you see instantly if a book or e-book is available from your local library. After you install the extension, you’ll need to add one or more libraries to the tool. Then, when you look at a book on sites like Amazon, Barnes and Noble, or Goodreads, within the seconds the extension will provide information on availability. 2. Select “Add extension.” Don’t panic when you read the (incomplete) alert. The only way that the extension will be able to provide feedback is if it can “rewrite” the Amazon, B&N or Goodreads page to show you book availability. 3. Configure the extension, so that it knows your local libraries. Look for the book icon in the Chrome extensions bar (upper right in the browser, to the right of the URL field and to the left of the settings icon) or use the menu to manage extensions (Window > Extensions). 4. Adding a library is straightforward. Then start typing your library name. Select the library from the dropdown menu. 5. By default, the extension will look for both paper books and ebooks. If you’re only interested in ebooks, deselect the book checkmark. No need to click “save” – the extension automatically saves your choice. 6. If you have a library card or check out privileges at multiple libraries, keep adding! By default, the extension is running searches. When you look at a book on Amazon, after a few seconds the tool will provide information about availability. To place a hold, select that option. The tool will launch the Overdrive page for that library. With any luck, you’ll get an exact match. To place a hold (or check out a book), you will need to be logged in to Overdrive. Finally, the extension works in real-time for Goodreads, as well. So there you have it. One of the most useful utilities that an avid reader could add to Chrome. The post Check library books availability while browsing! appeared first on WiredPen. On January 9, 2018, less than year after being sworn in as president of the United States, Donald Trump told his 2,000th lie. What if you could see a real-time assessment of a politician’s speech? Politicians don’t stop lying on Election Day. Adair now runs the Duke Reporters’ Lab and Duke’s DeWitt Wallace Center for Media & Democracy. FactStream is product of the Duke Reporters’ Lab. Although FactStream currently relies on a bevy of human fact-checkers, the project goal is automated detection using AI to match claims against published fact-checks. Interested in an event? Let FactStream send you a reminder. FactStream can remind you of an upcoming event, if you allow notifications. FactStream event pane currently has only one event. This mockup screen illustrates how a fact-check might appear on your screen. During an event, FactStream will launch a pop-up to alert users of either previously published fact-checks or real-time analyses of claims. Want to know more? Then tap the pop-up to read a fact-check, share the fact-check or opt-in to receive additional context about Trump’s statements. The Duke Reporters’ Lab has partnered with FactCheck.org, PolitiFact and the Washington Post to provide real-time fact-checking of President Trump’s State of the Union address on January 30. The team needs beta testers who use either an iPhone or an iPad. (1) Download FactStream from the App Store. Be sure to enable notifications if you want the app to remind you of tonight’s speech! (2) During President Trump’s speech (Jan. 30 at 9 p.m. ET), test the app’s various screens and share some fact-checks. (3) After the speech is over, send feedback through this Google Form. “Repeat a lie often enough and it becomes the truth”*, is a law of propaganda often attributed to the Nazi Joseph Goebbels. Among psychologists something like this known as the “illusion of truth” effect. In 2016, the BBC explored the power of repeated falsehoods (aka “lies”). Researchers from Vanderbilt University found that prior knowledge doesn’t prevent repetition from swaying our judgements on non-emotionally charged statements such as “The Atlantic Ocean is the largest ocean on Earth.” This falsehood has a very limited emotional component and most people learned this in geography. Nevertheless, repetition sowed doubt. Related to the need to shine a spotlight on lies is the challenge presented by confirmation bias. In other words, after we form an opinion, “we embrace information that confirms that view while ignoring, or rejecting, information that casts doubt on it.” This is an example of fast-thinking; confirmation bias is cognitively less taxing than actively seeking out information that might challenge our beliefs. In 2006, researchers in Colorado discovered that after being in discussion with mostly like-minded people, discussing controversial (i.e., emotional) topics, liberals became more liberal in their views and conservatives, more conservative. The challenge is that those most inclined to believe a politician’s statements (whether liberal or conservative) are those least inclined to use a tool like FactStream. This is a systemic, long-term problem that must be addressed in K-12 with a renewed (as well as “new”) approach to civics and media literacy. In 1846, five New York City newspapers banded together to communicate the news about the Mexican–American War. Publishers recognized a long time ago that news gathering is an expensive proposition with economic benefits from sharing costs. In December 1892, the Associated Press incorporated in Illinois. With a checkered history like most monopolistic organizations, however, AP eventually landed in court. In 1945, the U.S. Supreme Court found that AP had been violating the Sherman Antitrust Act (Associated Press v. United States). Although AP members exercised undue economic hardship on rivals, the economic rationale for collaborative reporting remains true today; it may be even more true today. News organizations, especially newspapers, did not anticipate how disruptive digital technology would be to entrenched local monopolies. Consolidation of ownership (across newspapers, radio and television) and loss of traditional advertisers (department stores have disappeared/consolidated, too) have meant newsrooms are shedding reporters and as well as photographers. President Jimmy Carter would appoint Keith to U.S. Court of Appeals for the 6th Circuit in 1977. Help the students and developers at Duke shine light on democracy tonight as they channel Judge Keith’s commitment to government transparency. Cross-posted at The Moderate Voice. * There is no reliable source for this claim; Wikiquote authors hypothesize that the punchy phrase is a variation of what Goebbels said about the “big lie”, a concept which originated with Adolf Hitler. The post Help shape the future of fact-checking during the State of the Union address appeared first on WiredPen. From this day forward, it’s going to be only America first. America first. It was not the first time Trump had used the phrase to describe his policy positions. The inaugural address was “at least in part written by Steve Bannon and Stephen Miller, two of Trump’s senior advisers” who are infamous for their anti-immigration, nativist viewpoints. Bannon is out but Miller is most very definitely still driving policy. Where did those viewpoints originate? According to a 2015 NPR article, the KKK was not a shadow organization in the 1920s. In the 1920s, membership in the KKK reached several million people — almost exclusively white, native-born, Protestant women and men. The Southern Poverty Law Center reminds us that the Ku Klux Klan had as its genesis the Civil War. The war ended in May 1865; the KKK was formed in December 1865. And it’s never gone away. Chart from Southern Poverty Law Center shows KKK groups from 2000-2016. The KKK revival in the 1920s coincided with opposition to immigration, primarily Catholics and Jews. (Hence the “One God” assertion in the flag.) Membership in 1925 was about 4 million; total US population was 116 million. In the 1960s, the KKK returned to its Civil War roots, opposing the civil rights movement and equal opportunity for black Americans. In this context, “America First” is not a position of trade and economics; it’s one of social class and bigotry. Hitler had invaded Poland the prior year. It [AFC] was funded by the families who owned Sears-Roebuck and the Chicago Tribune, but also counted among its ranks prominent anti-Semites of the day. In this context, “America First” was isolationist: let the rest of the world deal with its problems because they don’t affect us. This was not the first time America touted isolationist tendencies, nor would it be the last. In 1999, Pat Buchanan used “America First” as his presidential campaign slogan for his bid to be the Reform Party’s presidential candidate in 2000. Buchanan has called World War II an “unnecessary war,” which is a position hard to reconcile with human rights. Trump called Buchanan “a Hitler lover” after resigning as a member of the Republican Party; he was publicly considering a run for the Reform Party’s presidential nomination. Yet today “America First” — and all that it symbolizes — is at the fulcrum of his presidency. The phrase now encompasses both of those prior meanings: economic isolation and bigotry. For example, in the 1920s, the KKK supported restricting immigration to countries with Anglo-Saxon and Scandinavian roots which was codified with the Immigration Act of 1924. When President Calvin Coolidge signed the bill into law, the Klan celebrated the continued protection of the “purity” of American citizenship. A white Protestant citizenry and the desire to maintain their dominance culturally and politically, then, defined 100 percent Americanism. “Why are we having all these people from shithole countries come here?” Trump said, according to these people, referring to [immigrants from Haiti, El Salvador and African countries]. Trump then suggested that the United States should instead bring more people from countries such as Norway. Thirty-five new bilateral and regional trade pacts are under consideration around the world, according to the World Trade Organization. The United States is party to just one of them, with the European Union, and that negotiation has gone dormant. The United States is also threatening to withdraw from one of its existing multilateral agreements — the North American Free Trade Agreement with Mexico and Canada — if it cannot be renegotiated in the United States’ favor. to his words after America’s neo-Nazis took to the streets in Charlottesville, where he “defended far-right protesters … and [placed] the blame for the violence equally on what he called the ‘alt-left’.” A neo-Nazi protester, James Alex Fields, killed a counter-protester by running her over with his car. Fields has been charged with first-degree murder and faces life in prison. This is a presidency of divisiveness, not unity; a presidency that longs for a very imperfect past rather than a future resting on social and economic justice. The post The origins of Trump’s slogan, “America First” appeared first on WiredPen. For his role in unraveling the truth about the Watergate break-in, TIME named Judge John Sirica its 1973 Man of the Year. On June 17, 1972, four men broke into the offices of the Democratic National Committee in the Watergate office building. This “third-rate burglary” was orchestrated by the White House. It would, two years later, bring down President Richard M. Nixon. In October 1972, the Washington Post story “FBI Finds Nixon Aides Sabotaged Democrats” placed the responsibility for the Watergate burglary at the hands of aides to President Nixon. James McCord, one of the burglars (known as the “plumbers”), wrote a letter to Judge Sirica in March 1973. He claimed that the burglars were being pressured to plead guilty and keep quiet. Judge Sirica read the letter aloud in his courtroom. Four months later, Alexander Butterfield revealed that Nixon secretly recorded phone conversations. Butterfield is referred to in news reports as Federal Aviation Administration chief as well as a Nixon aide. Concurrent with Judge Sirica’s court, Congress was also investigating the Watergate break-in. So was the Department of Justice. On October 20, 1973, Nixon ordered Attorney General Elliot Richardson to fire Watergate prosecutor Archibald Cox. Richardson refused, choosing instead to resign. Deputy Attorney General William Ruckelshaus also refused and resigned. Nixon persuaded next-in-succession Solicitor General Robert Bork (who President Ronald Reagan would unsuccessfully nominate to the Supreme Court) to can Cox. These events became known as the Saturday Night Massacre. The Department of Justice appointed Leon Jaworski as the new special prosecutor on November 1. Judge Sirica would order President Nixon to give prosecutors the tape recordings of White House conversations about the Watergate break-in. The tapes revealed that Nixon had approved plans for the Watergate coverup six days after the break-in at the Democratic National Committee’s headquarters in the Watergate complex by men who were working for the Committee to Reelect the President. The tapes, with their infamous missing 18 1/2 minutes, contributed to Nixon’s resignation in 1974. The two times Judge Sirica ordered Mr. Nixon to turn over his tapes, first for tapes of 9 conversations, then for tapes of 64, the United States Court of Appeals affirmed. The second time the President took the case to the United States Supreme Court, which affirmed Judge Sirica’s ruling as well, in a landmark decision that the President was subject to the orders of the High Court (emphasis added). Judge Sirica’s suspicions proved solid: 19 officials of the Nixon administration and reelection campaign, including attorney general John Mitchell and two of Nixon’s closest aides (John D. Ehrlichman and H.R. Bob Haldeman), went to jail. * In total, 40 government officials were indicted or jailed. Facing impeachment proceedings in the House of Representatives, Nixon – the 37th president of the United States – resigned on August 9, 1974. It was seven months and two days after TIME’s man of the year cover. Nixon was the first President to resign his office. Spiro Agnew, Nixon’s vice president, had been convicted of tax fraud in Maryland and forced to resign but his departure had nothing to do with Watergate. Congress appointed Gerald Ford as vice president in his stead. Sirica, chief judge for the United States District Court for the District of Columbia, was a Republican. President Dwight D. Eisenhower appointed him to the Court on February 25, 1957. In 1971, by virtue of seniority, he became chief judge. Judge Sirica died in 1992 at age 88, after retiring from the bench in 1986. And Sirica was the son of an immigrant: his father emigrated in 1887 from a village near Naples, Italy. Although the focus of the Nixon resignation is on Watergate, the White House plumbers had burglarized psychiatrist Lewis Fielding’s office a year earlier. Their target? Daniel Ellsberg, the man who leaked the Pentagon Papers. The resulting exposes by the New York Times and Washington Post embarrassed the Nixon White House and its predecessors. They revealed that American’s military and presidents had known for years that Vietnam was an unwinnable war. Responses to The Times‘s publication of the Pentagon Papers and the case that followed reflected the degree to which the nation was divided over the war. Opponents of the war, such as Representative Edward I. Koch, of New York, and Prof. Hans Morgenthau, of the University of Chicago, strongly favored publication. Supporters of the war, ranging from Ronald Reagan to Jimmy Carter, were harsh in their criticism of The Times. Those exposes also led to a showdown with the Supreme Court and a ruling re-enforcing the first amendment. The post Watergate Redux: TIME’s man of the year is Judge John Sirica appeared first on WiredPen. On Wednesday, President Trump played golf in Florida at one of his golf courses. Then he told a whopper to West Palm Beach firefighters and paramedics. Trump is the fifth Republican president since Dwight D. Eisenhower assumed office in 1953. President Eisenhower is the only other modern Republican president to have both houses of Congress under his party’s control during his first year in office. Working with Congress, Ike signed more than five times as many bills as Trump did during his first year in office. The other four Republican presidents since Eisenhower faced either a divided Congress or one in direct opposition, yet they each signed more bills into law than Trump. But even with Congress and the White House under the control of the same party, Trump, Senate Majority Leader Mitch McConnell and Speaker of the House Paul Ryan could not surpass the record of Presidents Richard M. Nixon and George H.W. Bush (41) who had to work with a Democratic Congress. Each moved more than twice as many bills into law as Trump. Presidents Ronald Reagan and George W. Bush (43) each worked with a divided Congress to be achieve greater legislative success than Trump. Take a look at that chart again; data are from GovTrack and WiredPen. The four Democratic presidents since 1953 each had a unified Congress during his first year in office. All four succeeded in signing more bills into law than Trump. Congressional action has changed since the 1950s and 1960s: bills are broader, longer and more complex. Bipartisanship has vanished, as each Congress has become more polarized. Once again, Trump lied to America. The post Trump falls far short of Eisenhower’s first-year legislative record appeared first on WiredPen. As most things tweeted by Trump, the issue raised is far more complex than 140 or 280 characters can address. In this case, there’s the “obstruction of justice” story, the “he didn’t do it” story, and jarring rejection of social media best practices. Was Trump admitting obstruction of justice? The timing is an issue: did Trump know that Flynn had lied to the FBI when he tried to convince then-FBI Director James Comey to stop investigating Flynn? If yes, that’s obstruction of justice. Tell us, @realDonaldTrump, did you know Flynn had lied to the FBI when Counsel to the President Don McGahn snubbed Yates as she tried to warn the White House Flynn had been compromised? Did you know Flynn had lied to the FBI when you fired Yates days after her whistleblowing? After Twitter went into overdrive, Trump’s personal lawyer, John Dowd, claimed he sent the tweet. According to Mike Allen at Axios, Dowd drafted the tweet and gave it to White House social media director Dan Scavino. We’ll get back to this in a moment. When acting attorney general Sally Yates (later fired by Trump) went to the White House on Jan. 26, she told White House Counsel Don McGahn that Flynn had “given the agents the same story he gave the Vice President” about his interactions with Russians. We began our meeting [with White House counsel Don McGahn] telling him that there had been press accounts of statements from the vice president and others that related conduct that Mr. Flynn had been involved in that we knew not to be the truth. We felt like it was critical that we get this information to the White House in part because the vice president was unknowingly making false statements to the public and because we believed that General Flynn was compromised with respect to the Russians. In other words, Yates was advising the White House that Flynn was lying to the Vice President because she did not think Pence was knowingly misleading the public. But Dowd is claiming the opposite: that Yates said that Flynn told the FBI “the same story” that he told the Vice President. Moreover, Dowd is Trump’s personal lawyer. Why would he be weighing in on official White House communications? Who do you believe, Yates or Dowd? What else is wrong with this picture? Setting aside the political and legal ramifications of the tweet, there are three additional things wrong with this picture. First, Dowd indirectly claims that he drafted a tweet that was sent not by Trump but by the White House social media director. The very name of the account, @realDonaldTrump, is at odds with such a claim. On the other hand, Trump leases his name to so many things that he may treat the Twitter account like one of “his” buildings around the world. Second, normally accounts of politicians and celebrities carry an identifier when tweets are not composed by the named author. This is a social media best practice, and if Trump’s account is being run by anyone other than Trump, this practice should become SOP post haste, especially when tweets appear to be setting foreign policy. Evidence suggests Scavino is responsible for publishing some of Trump’s tweets — without our knowing if he also writes them. Wired published some “tells” in October when trying to determine if a tweet originates with Scavino or Trump. If the tweet consists of nothing but words and the occasional @-mention, Donald Trump probably did the tweet. CHECK. If it’s text-only and sent between 6 pm and 10 am, Donald Trump probably published the tweet. NOPE – however, this does not rule out his having dictated it. Was he playing golf on Saturday at noon? Third, publicly-available meta-data show that the Tweet was sent by an iPhone: just like the tweets before and after it and all of Trump’s tweets since earlier in the year when he had to give up his Android phone. If the tweet was sent by staff, not Trump, in a normal environment the tweet would be sent via a service like Hootsuite that makes it easy to compose tweets in advance and schedule the time of publishing. But this one was sent by an iPhone, which means someone other than Trump would have the password to set up the account on their own phone. Yet another example of how the Trump Administration deliberately dissembles and obfuscates the truth. The post Curiouser and curiouser: Trump’s tweet about Flynn and the FBI appeared first on WiredPen. When web pages are properly formatted, you can easily use Google spreadsheets to import (“scrape”) their data. Here’s how. I wanted to rank National Cancer Institute research expenditures by cancer type; on the website, the data are presented alphabetically. Log in to Google Drive and pick create new spreadsheet. Now that you have the data, you can make the comparisons – and charts – that interest you. How do you scrape data off a page that you’re interested in? To identify the HTML container, you can use the “inspect element” feature of your browser (Chrome, Safari*) by right-clicking the page near the title of the data. In well-formatted HTML, the container will be a table. then search for the HTML tag (in this case, I used <table — I don’t close the tag on search because sometimes there are CSS rules included in the tag space). You now have a new menu tab and an advanced set of tools at your disposal. Move up or down the page to see the element you’re interested in. The post Scrape the web: using Google Sheets to import data appeared first on WiredPen. This date is a different anniversary for me than for most. Sixteen years ago, Mike woke me to tell me about the towers. My mind jumped immediately to my best friend from high school, Rebecca, who worked on Wall Street. But once we got past the initial shock, and knew she was OK, our minds shifted. To me. And the reason I was still in bed when Mike came home to tell me about the towers. On 9/12, we would drive into Seattle for my complete hysterectomy. Life felt so crazy, however, that I called Virginia Mason to make sure my surgery would go ahead as planned. Because I had to start drinking a vile concoction to clear my bowels for abdominal surgery. And who wants to endure that torture if it’s not needed? I had gotten sick on our summer motorcycle trip in Europe and spent 10 days in the hospital in southern France with peritonitis accompanied by an ovary the size of an orange. Infection returned as soon as we got back to the States. My DES-christened, malfunctioning, female organs had to go. In retrospect, the surgery was a blessing. Not only did it give me focus outside of the horror show that was the east coast, I legally self-medicated with opiates (via a PCA pump) for several days. Not enough synapses working properly to concentrate to read. Not enough to watch TV. Unplugged, I was. So that time, for me, is a blur. I hold a few distinct images, of course. But I didn’t have to watch the planes crash and the towers die, over-and-over-and-over. The country changed that day, from one of optimism to fear. From one that mouthed “turn the other cheek” to one that fully embraced the vengeful “eye for an eye” God of the Old Testament. Despite surgery that, in hindsight, was the first step in erasing the essence of my femininity, I allowed myself to be loved. I allowed myself to ask for help. I truly let Mike into my life, an act for which I will be forever grateful. So today is a bittersweet anniversary. Just as I healed from those abdominal scars and lost hormones, and will heal from the mastectomy scars of last month and the chemo to come, we as a nation need to heal. I don’t know what route that will take. We pick at the scab of 9–11 because it’s profitable to politicians (and lots of businesses) to keep the wound festering. How do we honor those who died on 9–11 while acknowledging our catalytic actions that led to that day? How do we honor those who have lost homes, pets, jobs, friends to Harvey and Irma, while acknowledging our catalytic inaction that exacerbated the events of August and September 2017? How do we soberly reflect on our collective lives and then commit to change? We cannot afford unlimited vengeance. We have an obiligation to those not yet born to clean up the mess we are making of the world. We need another charismatic socialist to remind us that we are our brother’s keeper, we should venerate forgiveness, and our lives are richer when lived with kindness and compassion than with distrust and greed. The post This date is a different anniversary for me than for most. appeared first on WiredPen. There are lots of highlights of the James Comey testimony before the Senate Intelligence Committee on Thursday. But what I am interested in were the questions he didn’t answer. "I don't think I can talk about that in an open setting." The winner, in terms of clear questions, was former Democratic California Attorney General Kamala Harris. Silence in this case suggests wrong-doing. Are you aware of any meetings between the Trump administration officials and Russian officials during the campaign that have not been acknowledged by those officials in the White House? Are you aware of any questions by Trump campaign officials or associates of the campaign to hide their communications with Russia officials through encrypted means? In the course of the FBI’s investigation, did you ever come across anything that suggested that communication, records, documents or other evidence had been destroyed? And are you aware of any potential efforts to conceal between campaign officials and Russian officials? As the attorney general recused himself from the investigation, do you believe it was appropriate for him to be involved in the firing of the chief investigator of that case that had Russia interference? The winner in terms of creating soundbites for conservative media was Republican Tom Cotton of Arkansas. Did you or any FBI agent ever sense that Mr. Flynn attempted to deceive you, or made false statements to an FBI agent? Did you ever come close to closing investigation on Mr. Flynn? Heinrich (D-NM): Do you find it odd that the president seemed unconcerned by Russia’s actions in our election? Does that mean that the [president’s] dossier is not being reviewed or investigated or followed up on in any way? Is it not true that Mr. Flynn was and is a central figure in this entire investigation of the relationship between the Trump campaign and the Russians? Certainly, Mr. Flynn was part of the so-called Russian investigation? Can you answer that question? What do you know about the Russian bank, VEB? McCain (R-AZ): Are you aware of anything that would lead you to believe that information exists that could coerce members of the administration or blackmail the administration? And here they are, from the NY Times (I subscribe) transcript. Also included: “I can’t answer.” Remember, Comey is speaking under oath. BURR: At the time of your departure from the FBI, was the FBI able to confirm any criminal allegations contained in the Steele document? The “Steele document” is the expose from former MI6 spy Christopher Steele that suggested Donald Trump might be susceptible to Russian blackmail. It hit the press in January prior to the inauguration. Comey’s second refusal was also related to the Steele expose. RISCH: On — I remember, you — you talked with us shortly after February 14th, when the New York Times wrote an article that suggested that the Trump campaign was colluding with the Russians. You remember reading that article when it first came out? COMEY: … communications. Yes, sir. Also on 14 February (coincidence? ), Trump invited Comey to dinner. This was Comey’s third refusal to answer or continue answering. WYDEN: How would you characterize Attorney General Sessions’s adherence to his recusal? In particular, with regard to his involvement in your firing, which the president has acknowledged was because of the Russian investigation. COMEY: That’s a question I can’t answer. I think it is a reasonable question. If, as the president said, I was fired because of the Russia investigation, why was the attorney general involved in that chain? I don’t know. So I don’t have an answer for the question. AG Sessions was part of the Trump campaign apparatus. HEINRICH: So there are reports that the incoming Trump administration, either during the transition and/or after the inauguration, attempted to set up a sort of back-door communication channel with the Russian government using their infrastructure, their devices or facilities. The claim Heinrich references relates to the alleged request for a secret communications channel that Jared Kushner and former National Security Adviser Michael Flynn made to Russian ambassador Sergey Kislyak in Trump Tower. Republicans asked several times if Comey had told Trump that he was not personally under investigation. KING: Certainly, Mr. Flynn was part of the so-called Russian investigation? Can you answer that question? King is unable to score points for liberal pundits. Blunt and to the point; Cotton is asking Comey if he’s willing to conjecture, knowing that the answer will be “no.” Provides good headlines/talking points for conservative media. COTTON: Do you have — at the time the story [referenced above, NYT on 14 February] was published, any indication of any contact between Trump people and Russians, intelligence officers, other government officials or close associates of the Russian government? Cotton’s questions are focusing on pre-augural allegations. Very strategic for headlines. HARRIS: I have a series of questions to ask you, and — and they’re going to start with, are you aware of any meetings between the Trump administration officials and Russian officials during the campaign that have not been acknowledged by those officials in the White House? HARRIS: Are you aware of any questions by Trump campaign officials or associates of the campaign to hide their communications with Russia officials through encrypted means? HARRIS: In the course of the FBI’s investigation did you ever come across anything that suggested that communication, records, documents or other evidence had been destroyed? COMEY: I think I’ve got to give you the same answer because it would touch on investigative matters. HARRIS: And are you a wear of any potential efforts to conceal between campaign officials and Russian officials? HARRIS: And the attorney general recused himself from the investigation, do you believe it was appropriate for him to be involved in the firing of the chief investigator of that case that had Russia interference? COMEY: It’s something that I can’t answer sitting here. It’s a reasonable question. It would depend on a lot of things I don’t know, like did he know, what was he told, did he realize the investigation, things like that. I just don’t know the answer. McCAIN: Are you aware of anything that would lead you to believe that information exists that could coerce members of the administration or blackmail the administration? The post Comey testimony: “I don’t think I can talk about that in an open setting” appeared first on WiredPen. Former FBI Director James B. Comey will testify publicly on Thursday June 8 before the Senate Intelligence Committee. The hearing begins at 10 am Eastern (7 a.m. Pacific) at the Capitol in Washington, D.C. After the public hearing, Comey will testify in a non-television closed session starting around 1 pm Eastern. ABC, CBS and NBC as well as FOX will broadcast live, an unusual move for network television. President Trump fired Comey on May 8. His testimony is widely anticipated. Read his opening statement (pdf); pre-release gives the White House a chance to prepare a response. The LATimes will livestream the hearing on Facebook and their live blog starting at 7 a.m. Pacific. The U.S. Senate will stream the proceedings. ABC News is being anchored by George Stephanopoulos. CBS This Morning co-hosts Norah O’Donnell, Gayle King and Charlie Rose are anchoring the CBS coverage. They will be joined by “Face the Nation” anchor and chief Washington correspondent John Dickerson and chief legal correspondent Jan Crawford. CNN is streaming live and broadcasting. FOX News plans pre-hearing coverage with Bill Hemmer and Shannon Bream; they will be joined by Bret Baier, Chris Wallace and Dana Perino. NBC News chief legal correspondent Savannah Guthrie is anchoring from Washington, D.C. with Lester Holt, Guthrie and Chuck Todd co-anchoring the NBC coverage from Washington, D.C. Matt Lauer is anchoring from New York. The post How to watch Comey’s Senate Intelligence Committee testimony appeared first on WiredPen. Sloppy reporting does the republic no favors. There’s plenty of fodder for teeth gnashing in DC, but what set mine on edge today was how the Associated Press reported on a list of possible FBI directors. Moreover, this AP story (pdf) which I encountered about an hour after it went live on the AP website, provides fodder for anyone who thinks that “the press” is “out to get” the president. James R. Clapper Jr. has served director of various national intelligence agencies under Presidents George H.W. Bush (1991-1995), George Bush (2001-2006) and Barack Obama (2007-2017). He spoke on CNN’s “State of the Union” with Jake Tapper on Sunday. You won’t learn his full name, anything about his bi-partisan service, or where he made his comments in the AP story. I have marked it up as I would have had it been turned in as a college class assignment. There are no links in the AP story. None. I don’t know if this is a fault of the AP content management system, the reporter, or the editor. But it does the reader — as well as the Associated Press and the news organizations obliquely referenced — a disservice. What do you think? Am I too harsh? Not harsh enough? WASHINGTON (AP) — American democracy is separately “under assault” from President Donald Trump and Russia, the former U.S. intelligence chief warned Sunday, expressing dismay over the abrupt firing of FBI director James Comey amid a probe into Moscow’s meddling in U.S. elections and possible ties with the Trump campaign. Who? The lede requires that the reader know and hold the headline in her head. And the sentence is far too long: almost 50 words. That’s a long breath. Which lawmakers? Whose words are in quotes? Links are your friend. When? Under what president? What has he done since? What is James Clapper’s full name? When? Where? By whom? Passive tense. When? Where? Trump fired Comey on Tuesday. Today is Sunday. Context needed. The White House had no immediate comment on Clapper’s remarks on a morning in which no White House aide appeared on the Sunday news shows to discuss Trump’s firing. Who said? How do you know? But UN Ambassador Nikki Haley was on the same CNN show as Clapper. Secretary of State Rex Tillerson appeared on NBC. Lawmakers from both parties reprimanded Trump’s actions last week, which included shifting explanations from the White House for Comey’s dismissal and an ominous tweet by Trump that warned Comey against leaks to the press because he may have “tapes” of their conversations. The lawmakers urged Trump to select a new FBI director without any political background and said the president would need to hand over to Congress any taped conversations with Comey, if they exist. Sweeping generalization. Only three are quoted in this story. Links are your friend. Standard protocol is to include state information, either as narrative or in parens: (S.C.) This is particularly important if the Senator is going to be referenced later by his state, as in this story. Also, tell us when/where/to whom Graham said this. Putting that information in the last graph of a story this long (20+ paragraphs) is not sufficient. Organizations don’t speak. People do. Who says? Graham has not been IDed as a South Carolina senator. Who asked the question? Calling Trump’s remarks about possible taped conversations “outrageous,” Sen. Mark Warner of Virginia, the top Democrat on the Senate Intelligence Committee, said his panel or another congressional committee would “absolutely” subpoena the tapes. “We have got to make sure that these tapes, if they exist, don’t mysteriously disappear,” he said. This would be an appropriate time to reference Watergate. Warner also said he hopes to have Comey testify in a public hearing before his committee. Comey earlier declined an invitation this week to testify in a closed hearing. Links are your friend and answer the “who said” comment that this sentence generates. Trump abruptly fired Comey on Tuesday and later said Comey was a “showboat” and “grandstander” who was not doing a good job, drawing a firestorm of criticism. Trump said in an interview with NBC that the Russia investigation factored into his decision to fire Comey. The changing rationales the White House offered added an element of chaos to the president’s action. Links are your friend. When did he say the words in quotes? Link to NBC interview (when? with whom?) Link to changing rationales. Who said there is “chaos”? Who says? Also, best practice is no colon as this is constructed. Add “the following” and then use the colon. Sessions has faced questions over whether his involvement in Comey’s firing violates his pledge to recuse himself from investigations into Russian interference in the election. Who has asked questions? When did he recuse himself? Links are your friend. She said this when? Where? To whom? And this explanatory paragraph fits more appropriately above, where Sessions and Rosenstein were first mentioned. Tucking this in at the end of the story is lazy sourcing. Addendum: I started writing as 12:42 pm Pacific, three hours ago. At that time, AP said the story was one hour old. AP still shows the news story as being published “one hour ago”. It is the lead politics story, which says it was published two hours ago. Top politics news screen grab at 3:40 pm Pacific. I saw the story on the AP website at about 12:30 pm Pacific; at that time, the time stamp on the story said it had been published an hour earlier. The post Newswriting 101: deconstructing an AP story appeared first on WiredPen. The NYTimes added to its stable of conservative op-ed columnists by hiring Bret Stephens, a former Wall Street Journal columnist with a Pulitzer for commentary. His inaugural column, Climate of Complete Certainty, was meet with vociferous pushback. On Friday, Bennet’s new hire published “Climate of Complete Certainty,” a dreadfully argued piece contending that … well, the point is buried in false starts, bogus reasoning and imprecise writing… As this blog noted on Friday, speaking of climate change as a future problem shortchanges the entire issue. It’s already inundating people, as the New York Times itself has reported on the other side of its news-opinion firewall. [T]he column reinforces the idea that [people who are skeptical about climate change] might have a point. The New York Times push notification that went out Friday afternoon about the column said as much—“reasonable people can be skeptical about the dangers of climate change,” it read. That is not actually true, and nothing that Stephens writes makes a case for why it might be true. This column is … a dog whistle to people who feel confused about climate change. It’s nothing more than textbook denialism. The crux of Stephens’ piece is that normal citizens shouldn’t accept the evidence released by scientists and political activists, and that’s why the current debate is a struggle. Let’s start with the headline: “Climate of Complete Certainty”. Science does not argue “complete certainty.” With this beginning – which he revisits in the column – Stephens rests his case on a strawman, a common rhetorical fallacy. Claiming total certainty about the science traduces the spirit of science and creates openings for doubt whenever a climate claim proves wrong. In reality, pretty much every aspect of science has some aspect of uncertainty, error bars, or ranges of outcomes — including essentially every medical course of treatment you were ever recommended and every science policy recommendation ever offered by the scientific community to policymakers. No working scientist claims 100% certainty about anything. Stephens is arguing with a ghost, something that doesn’t exist. Yes, Stephens is setting up a column about climate change — what most of us call hard science — with anecdotes about political polls (which were correct, by the way — you know, margin of error) and memorable non-scientific decisions. Is there anyone who truly thinks that public opinion research has the same degree of rigor as climatology? Just 36 percent of Americans care “a great deal” about the subject. How can that be, he asks. Pew points out that “liberal Democrats and conservative Republicans see climate-related matters through vastly different lenses.” But despite this partisan difference, only 1-in-4 Americans care very little (‘not at all’, 8%; ‘not too much’, 18%) about climate change. Just like big tobacco, industry seeks to manufacture doubt. To the extent that science knowledge influences people’s judgments related to climate change and trust in climate scientists, it does so among Democrats, but not Republicans. This group is composed primarily of Democrats (72%), but roughly a quarter (24%) is Republican. Despite industry efforts to create doubt, most Americans (67%) believe climate scientists should “have a major role” in climate policy. Only 1-in-10 think they should have no role. But that claim is … broken. The 0.85°C number is presented in the report as a range – 0.65 to 1.06 °C – because these reports are the antithesis of black-and-white thinking. The 0.85°C number is global, not North America. The Northern Hemisphere is warming more quickly than Southern (we have more land): ~1.5°C. Politics is the central factor shaping people’s beliefs about the effects of climate change, ways to address warming, trust in climate scientists. Columns like this one aid and abet that doubt. The post Bret Stephens and the manufacture of doubt appeared first on WiredPen. “If it bleeds, it leads” is a classic media trope. Not for the first time, that urge for sales (newspapers), viewers (TV and cable) and clicks (all things web) have elevated fear over truth. In the process, the fourth estate shirks its role in helping voters make informed choices. It’s easier to be killed by a terrorist than it is to find a husband over the age of 40. That quote comes from Sleepless in Seattle. But its root was a June 1986 cover story in Newsweek, a story that has been debunked and retracted, 20 years later. Fear sells, even when it’s false. On Friday, the U.S. Department of Justice issued a news release chastising nine jurisdictions that are colloquially known as “sanctuary cities.” These cities are, according to the DOJ, “crumbling under the weight of illegal immigration and violent crime.” Notice how crime is being linked with immigration? That linkage is made believable to the casual reader because of how media report violent crime. In the United States, when a violent attack by an extremist group has an Islamic component, it gets about five times (449%) more coverage than a similar attack by a domestic group. Whether the disproportionate coverage is a conscious decision on the part of journalists or not, this stereotyping reinforces cultural narratives about what and who should be feared. By covering terrorist attacks by Muslims dramatically more than other incidents, media frame this type of event as more prevalent. Their data covers the period 2011-2015 and shows that almost one-fifth of the media coverage on terrorism was the Boston Marathon. That explosion killed three civilians and injured dozens. Wade Michael Page’s attack on the Sikh Temple in Wisconsin killed 6 people and it only received 3.81% of the total coverage. Frazier Glenn Miller’s attack on a synagogue in Kansas killed 3 people and it only received 3.27% of the coverage. Dylann Roof killed 9 people in an African-American church in Charleston and received 7.42% of the coverage. These attacks have three things in common: the perpetrator was a white man and the targets were both religious and minority groups. These instances highlight disparity in media coverage of terrorism (emphasis added). Data from the GAO reflect a related disparity: most extremist attacks that result in death in the U.S. originate with far right groups. From 12 September 2001 to 31 December 2016, there were 62 attacks by far right extremists that resulted in deaths. There were 23 such attacks that GAO label “radical Islamist.” Score: 73% for far right extremists, that’s about 3-in-4. However, 16 of the 23 “radical Islamic” attacks (70%) were undertaken by John Allen Muhammad (then aged 42) and Lee Boyd Malvo (then 17). They killed 17 people over the course of eight months, with 10 over a three-week period in October 2002. Their link to Islamic terrorism was weak. Only two of the 62 far right affiliated perpetrators had multiple attacks (two each). West Point’s Combating Terrorism Center reported in 2013 that right-wing violence during the period surpassed that of the 1990s by a factor of four. The attacks included the 2012 massacre of six Sikhs at a Wisconsin temple by neo-Nazi Wade Page. From 2015 to 2016, the number of anti-Muslim hate groups tripled, increasing from 34 to 101. These far right, mostly white, groups are attacking people of color. Through their choice of coverage, U.S. media are tacitly saying that white deaths matter more than people of color. [W]e are living in the most fear mongering time in human history. And the main reason for this is that there’s a lot of power and money available to individuals and organizations who can perpetuate these fears. Chapman University studies “fear” (or anxiety). In 2016, the top fear in the U.S. was corrupt government officials. Coming in second: a terrorist attack. The risk of dying in a terrorist attack: about 1 in 20 million each year. Being struck by lightning: about 1 in 700,000. Dying in a car accident: about 1 in 47,700. Stir up fear and then provide the solution? Media must do better: the nature of our society and government depend on it. The post US media as scaremonger appeared first on WiredPen. Government data visualization on steroids. Courtesy of … Steve Ballmer? USAFacts was inspired by a conversation Steve Ballmer had with his wife. She wanted him to get more involved in philanthropic work. He thought it made sense to first find out what government does with the money it raises. Where does the money come from and where is it spent? Whom does it serve? And most importantly, what are the outcomes? [Ballmer] hopes to open it up so that individuals and companies can build on top of it and pull out customized reports. Pardon my second WTF? Ballmer didn’t know that NFPs rely on government grants, especially those dealing with poverty and health? And he gets to influence government more than most, because, money? It’s Ballmer’s attempt to provide a website that consolidates public data from all levels of government: federal, state, local. The U.S. Constitution lays out four goals for government, and Ballmer’s team used those goals to provide a framework for the data. There’s a LOT of data, some of it in infographics, much in tables. But it’s far more than is possible to review on day one. It’s a 316-page, chart-heavy filing that [Ballmer] acknowledges is geared toward the business set. As for the risk factors outlined in the 10-K report? But Ballmer doesn’t peg government — or its hyper-partisanship — as a risk to itself. The 10-K doesn’t highlight the quirks of the U.S. Congress that render it difficult to pass legislation, the slow-moving nature of the rest of Washington, or the role of corporate executives — Ballmer included — to fund political candidates for those very offices. And, most obviously, it doesn’t mention Trump or his administration, which is often faulted for deviations from fact. But is there really a paucity of data? [The site rests on] a belief that voters and regulators alike could make better decisions if only they had unbiased, unpolluted information at their fingertips…. From simple Google and Wikipedia searches to deeper number-crunching work published by nonprofits like the Sunlight Foundation, there’s an existing wealth of scannable data about U.S. tax dollars and how, and on whom, they’re spent. @Steven_Ballmer Went to your new usafacts,org. "revenue from washington state initiative 502"
The post Ballmer spends $10M to pull government data into one site appeared first on WiredPen. 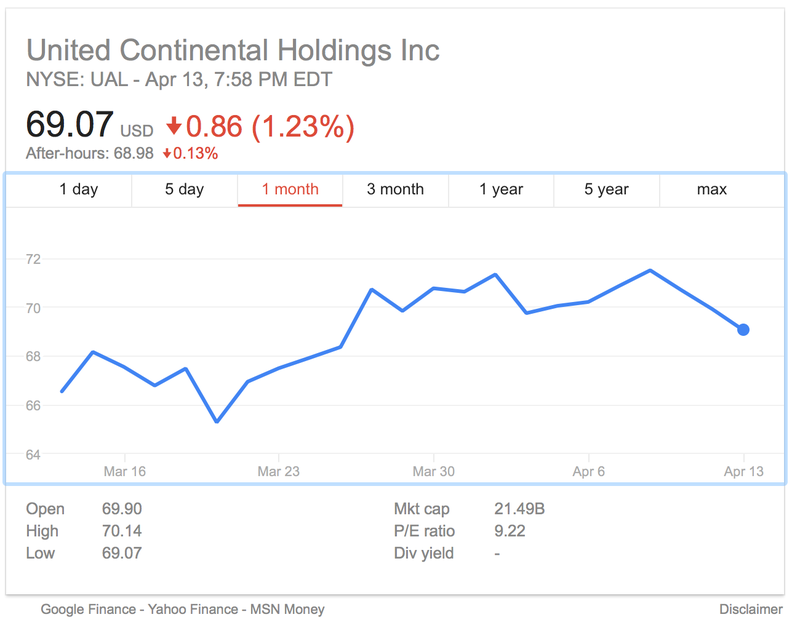 It’s been a long week for United Airlines, with no end in sight. In his initial response to Sunday’s deplorable corporate behavior on United Flight 3411, Oscar Munoz, United’s CEO, talked about “re-accommodating” customers and characterized the event — a passenger being dragged off a United airplane by his arms and legs — as a consequence of “overbooking” . On Thursday, the attorney for the man dragged from the plane, Dr. David Dao, 69, told the world that his client suffered a concussion, a sinus injury, and a broken nose. The Chicago officers who dragged him off the plane also knocked out two of Dao’s teeth. Attorney Thomas Demetrio said that United employees asked Dao’s wife to leave the plane after he was forcibly removed. In at least one of the consumer videos of Sunday’s brutality, you can see a woman exit the plane at the end of the video. Airlines routinely overbook flights in order to fly with as few empty seats as possible. Anyone who has traveled a bit knows this. Thus United’s characterization was an adroit “PR” move in the disparaging/spin sense of the phrase. Media, pundits and politicians swallowed “overbooking” whole and unthinkingly; they prattled it back to us, stenography-style. Even though it was clear, from the beginning, that the passenger had boarded the plane. The former CEO of Continental Airlines (maybe this explains the ‘former’ part) asserted on Monday that the situation was “an oversale obviously” (it wasn’t). He contended that it was the customer being forced from his seat who was acting in an “immature” manner. That’s pretty much what Munoz also said on Monday in his letter to employees. Can you get a better example of CEO privilege on display? News media repeated United’s “overbooking” explanation, ad nauseam, despite United’s confirmation that seats were needed for four crew members. Not a routine “oversold” problem. Four employees needed to get from O’Hare to Louisville, and according to Munoz, they didn’t approach the gate until after the flight was fully boarded. You know. Late. Ethically, the decision to pull four paying customers from their seats was wrong. Legally, it’s questionable as well. On Tuesday, the company admitted that the flight was not overbooked. United spokesman Jonathan Guerin said Tuesday that all 70 seats on United Express Flight 3411 were filled, but the plane was not overbooked as the airline previously reported. Instead, United and regional affiliate Republic Airlines, which operated the flight, selected four passengers to be removed to accommodate crew members needed in Louisville the next day. Assume for a moment that all of this had happened before passengers were boarded. 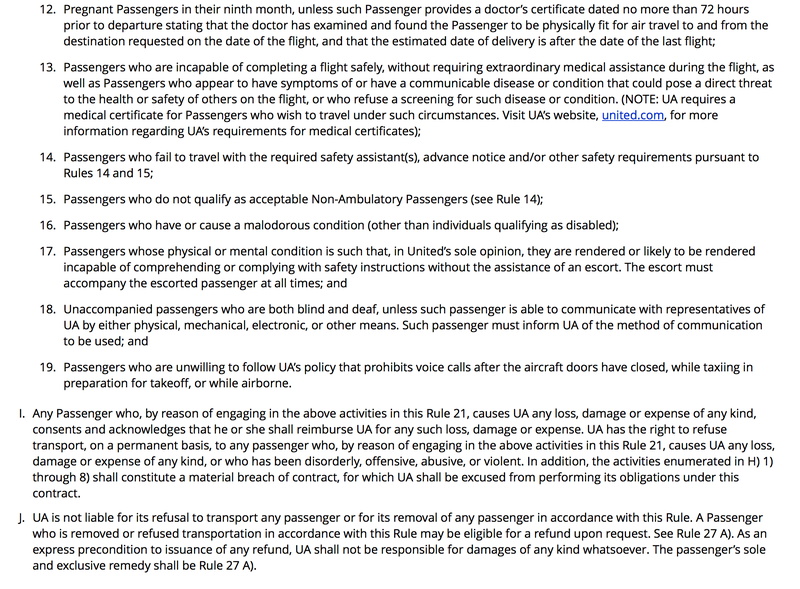 United’s “denial of boarding” contract provisions apply only to flights that have been oversold. Oversold Flight means a flight where there are more Passengers holding valid confirmed Tickets that check-in for the flight within the prescribed check-in time than there are available seats. 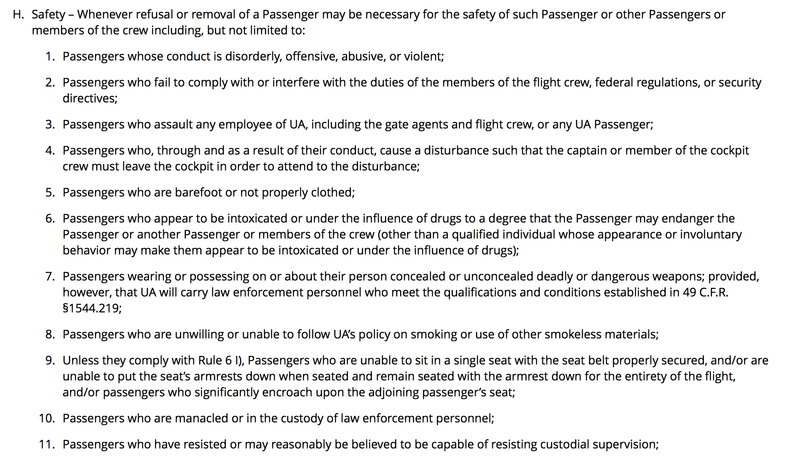 United, according to its own policies, had no right to deny anyone boarding so that employees could fly. Especially employees who showed up late to the gate. However, what took place on Sunday was not denial of boarding. Even now, after United stated publicly that the flight was NOT overbooked, news stories are still talking about “overbooked” flights. No national news report that I have seen has examined United’s contract of carriage, which details the reasons that it can remove a passenger from the plane after (in this case) he has been seated. I know, I know, this would mean that they would have to retract headlines like this one. No national news report that I have seen has examined why these crew members were trying to take the last flight of the day or why they were late. Had the crew been suddenly assigned a flight out of Kentucky? Do they live (or were they visiting) in Chicago and Louisville was their home base? On Tuesday, Munoz issued a second apology. If your company does not have a crisis communications plan in place for when (not if, when) a video of something “bad” happening on your watch makes its way to Twitter and Facebook, and you’re the chief communications officer, you need to resign or be fired. United is the world’s largest airline, in terms of number of destinations served. And it clearly had no such plan in place, despite the infamous leggings incident (a mere two weeks ago). However, screwed up communications about a disaster and a CEO with foot-and-mouth (just trust the lawyers to craft the statement) disease is not the problem. Saying United has a “PR problem” suggests the “solution” is akin to putting some lipstick on that pig. Modifying external appearance (we might call that sleight of hand) does nothing to change the fact that the pig is still a pig. United’s problem is not skin-deep. It’s soul deep. As others have pointed out, the federal government has allowed airline consolidation to occur, unabated. And, apparently, relatively unregulated, in terms of consumer protection. The roomiest economy seats you can book on the nation’s four largest airlines are narrower than the tightest economy seats offered in the 1990s. The worst seats today measure either 17 or 17.2 inches, when about 19 was as tight as it got through the 1990s. In fact, even the widest seats for sale in economy today—from 17 to 18.5 inches —would not have been offered several years ago. For comparison, up in the front of the cabin, premium class seating on the Big Three usually measures 21 inches. Consumers have shown that they’re willing to put up with an awful lot, including lack of legroom, lack of amenities, mediocre or worse customer service, dirty airplanes and more to save money. Sometimes, you need to fly. Funerals. Family emergencies. In a country with abysmal vacation policies relative to Europe, for example, flying is the only way to “vacation” on the other coast. So you take what’s available. That doesn’t mean you like it. /4 Individual consumers don’t have “power” to challenge a giant like @United. Vastly unequal market power calls for regulation. And those decisions about seat configuration on new planes? They’re made years in advance. Years. Today, airlines make a substantial chunk of their income by selling services (credit card alliances) and charging fees for everything from checked baggage to a “better” seat (which, as USA Today noted in 2014, is worse than an average seat 20 years ago). Don’t expect Wall Street to force a change in corporate behavior. UAL closed higher on Thursday 13 April (69.07) than it did the Monday after the leggings incident (68.37). Airline policies on overbooking, involuntary denial of boarding, and “refusal of transport” (which is what happened in this case) need to be transparent and uniform across airlines. “PR” can’t “fix” United’s problem. The only thing that can “fix” the greed that underlies Sunday’s shocking behavior is a widespread public discussion of realistic returns on investment, the appropriate balance between human dignity and capital. United’s greed is a symptom of a systemic problem, a philosophy not limited to the airline industry. Fundamentally, the fix lies with the collective “us” pushing back in a world that is becoming increasingly undemocratic and grossly unequal. Everyone keeps using the @United spin of 'overbooking'. It wasn't. The four seats were needed for EMPLOYEES Not Paying Customers. The Chicago Police Department went even further in dissembling, saying that a passenger “fell.” All three have been placed on leave. The post United Airlines does not have a “PR” problem appeared first on WiredPen.